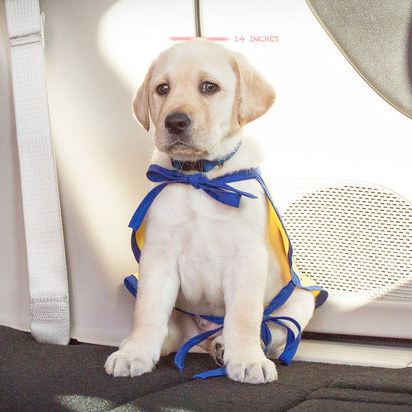 Fans can follow Canine Companions puppy Foley – tracking his growth and learning about the overall training journey from puppy to fully trained assistance dog – across the brand's social channels, in addition to Chrysler.com. Chrysler brand is launching a new online social initiative in partnership with Canine Companions for Independence®, the largest non-profit organization for assistance dogs in the U.S. The initiative will help raise awareness and support for the training and placement of Canine Companions for Independence assistance dogs under the organization's "Give a Dog a Job" campaign, a fundraising and awareness campaign that helps place them with adults, children and veterans with disabilities. Consumers will first meet Canine Companions puppy Foley, a Golden Retriever, Labrador cross (and the Chrysler brand's first official PacifiPuppy!) on Monday, March 13, and follow him as he goes through his formal training with his recently assigned puppy raiser. Fans can engage with Foley with the #RaisingFoley and #FoleyFriday hashtags on Facebook, Twitter and Instagram. "Through our partnership with Canine Companions for Independence, the Chrysler brand is able to help bring awareness to its 'Give a Dog a Job' program through our new online social initiative," said Tim Kuniskis, Head of Passenger Cars, Dodge, SRT, Chrysler and FIAT, FCA North America. "As we follow Foley through his journey, fans will get a first-hand look at watching him grow and learn, from puppy training to becoming a fully trained assistance dog, and also gain an understanding of the huge amount of time and resources it takes to train these amazing dogs." "Our partnership with Chrysler Pacifica, BraunAbility and our 'Give a Dog a Job' campaign brings our mission, the stories of our remarkable graduates and the adventures of Canine Companions puppy Foley to a whole new audience across the country," says Paul Mundell, CEO of Canine Companions for Independence. "We are deeply grateful for the commitment made to us by these two leaders in adapted vehicles. The upfitted Chrysler Pacifica provides greatly enhanced independence for people with disabilities, especially those who utilize wheelchairs." "Because of highly trained assistance dogs like my dog Mork, people like me are able to lead more full and independent lives," said Wallis Brozman, Corporate Marketing Assistant, Canine Companions. "Mork was trained by Canine Companions' professional instructors in 40 spoken commands and has since learned American Sign Language and approximately 15 new commands. This campaign is educating the public on the unique contributions our service dogs make in the lives of adults, children and veterans with disabilities. The program will also raise funds to allow us to place more exceptional dogs like Mork with people like myself. Without Mork's help, I didn't feel like I could safely leave my home. Mork is my independence on four legs." Under the "Give a Dog a Job" campaign, trained service dogs across the country are empowering wheelchair users daily by completing everyday activities, including getting in and out of their wheelchair-accessible vehicles. Hundreds are currently on the waitlist to receive a trained assistance dog, which is provided to a person with a disability free of charge. It takes two years to fully train a Canine Companions assistance dog, including six to nine months of professional training. To raise, train, place and support a certified assistance dog amounts to a $50,000 investment. Followers can donate at www.driveindependence.org. Chrysler brand and BraunAbility recently joined forces to design a wheelchair-accessible Chrysler Pacifica minivan providing the largest interior space as well as the widest door opening and side-entry ramp in the industry. Canine Companions for Independence provides highly trained assistance dogs free of charge to children, adults and veterans with disabilities. Established in 1975, Canine Companions has trained more than 5,300 assistance dog teams, with six training centers across the country in Northern California, Southern California, Florida, New York, Ohio and Texas, and over 3,000 volunteers nationwide. Canine Companions is recognized worldwide for the excellence of its dogs, and the quality and longevity of the matches it makes between dogs and people. The result is a life full of increased independence and loving companionship. For more information, visit cci.org or call 1-800-572-BARK (2275).